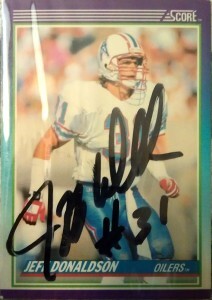 Jeff Donaldson was drafted by the Houston Oilers in the 9th round of the 1984 draft out of Colorado. By 1986, he was starting at free safety for the Oilers in Jerry Glanville‘s defense. An aggressive, hard hitter, and good special teams performer, Donaldson had a career high 110 tackles that season. He was a great example of the ‘House of Pain’ moniker that the Oilers embraced during the late 80’s. In 1990, with changes coming for the Houston Oilers organization, Donaldson was left exposed Plan B by the team. 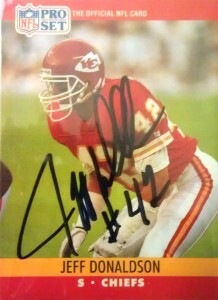 He’d sign with the Kansas City Chiefs that season. He’d finish his tenure on the Oilers with 446 tackles. Jeffires right in front of Donaldson. After the season, Donaldson reunited with Jerry in Atlanta for the 1991 season. He’d play with the Falcons through the 1993 season and retire. He currently lives in Colorado. I had tried to get Donaldson’s autograph back in… 2011, but did not receive a response. He has been responding to TTM requests sporadically as of late, but I figured that I might as well knock him out via a large lot acquisition instead.